Andrew Glazewski was a Polish Catholic priest who became a healer after he settled in Britain in 1947. 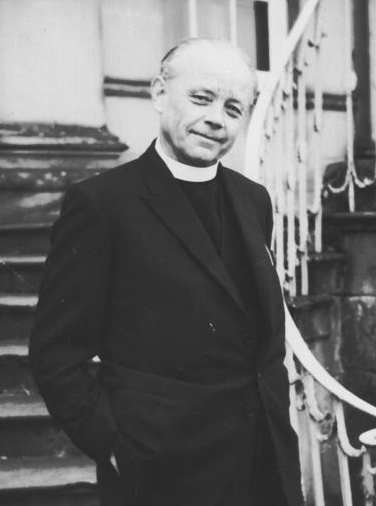 As an army chaplain he had been wounded twice in the Second World War which was when he first came to the south of England in 1940. After the war he became a parish priest at Ilford Park in Newton Abbot in Devon where he remained until his death. What is remarkable about Andrew is the depth of his research into matters of the spirit. He discovered that he could heal through his hands, even over large distances, and so he began an exploration into trying to understand these phenomena that led him on to publishing papers on the nature of gravity, magnetism, prayer and healing. Specialist research was carried out about sound and musical harmonics with regard to the developing form of crystals and plants. In 1951 he published a paper ‘The Music of Crystals, Plants and Human Beings.’ He was influenced by the work of Carl Jung and the teachings of Thomas Aquinas and developed a form of contemplative prayer that was closer to meditative practice. He tried to explain God as ‘a field’ that permeated all nature. In 1965 Sir George Trevelyan invited Glazewski to Attingham Park and he began to teach regularly there over the next six years. His vision was to establish a new university but when this proved difficult he co-founded The Scientific and Medical Network. Among his published papers are: ‘Can There Be Any Science Behind Healing Hands?’ (London Hospital Gazette 1967), ‘The Pattern of Telepathic Communication’ (The Radionic Association 1974) and ‘The Mechanics of Prayer’ (Wrekin Trust 1974). In 2014 White Crow Books published ‘Harmony of the Universe. The Science Behind Healing, Prayer and Spiritual Development’ by Andrew with Paul Kieniewicz that lays out his work in an ordered, comprehensive way. There is also a Facebook page for Andrew that includes special excerpts from his work and his letters including a beautiful description of The Angelic Heirarchy: ‘Now in each of these choirs there are higher and lower spirits, subordinated as well as concentrated, that is harmoniously related into a set of new proportions whereby all the proportions of each individual is a further development of the other. A magnificent correlation and totality in all of this. It is all, so to speak, music in shape and movement, constantly displaying the changes of the set of proportions, and so acquiring a new pattern, but still being recognised as the same species.’ Here is Andrew trying to open a window onto a wonderful mysterious world and this was his gift to the world in his lifetime.